Tell us about yourself! I am Allie Geeslin, and I am currently a second year physical therapy student at UT Southwestern in Dallas but more importantly, I am a wife, daughter, sister and friend! I am from Arlington – I love being close to where I grew up still – My parents still live in the same house where I grew up, and I am thankful to have them so near. What inspires you? My husband. He is so hard-working and honest. And hilarious. He never fails to make me laugh. While I am in school, he has taken on pretty much all of the house responsibilities – he cleans, cooks, does the laundry, makes my lunch, makes my coffee – anything you can think of, he does it for me, so I can study more effectively without worrying. He prays with me and for me and encourages me in everything. He is my best friend, and I am so incredibly thankful God brought him into my life. I seriously couldn’t (and wouldn’t want to) do life without him. New York City – I love that place. It is my favorite. The hustle and bustle of the city. It makes me wonder what everyone is in such a hurry about. It makes me want to know their story and their worries and their daily activities. I like silently praying for people I see that I don’t know. I know everyone has their own “stuff” going on, so I pray that God reveals himself to them. While there is hustle and bustle, I love the quiet cafes just around each corner. I love people watching, and I love finding a part of the calm in the middle of the storm. And oh man, kids inspire me. Their heart and their joy. Their curiosity that can’t be quenched. Their acceptance of everyone. I wish I was like that. I wish I had that energy for God and for others. I wish I loved unconditionally and with such joy that they do. What are your gifts and talents? To be perfectly honest, this question was really hard for me. I feel so beat down with school all the time that it’s hard for me to identify anything I’m good at. That sounds really depressing, doesn’t it? Ha. I just mean that I am so narrow-minded with focusing on school that I forget to remember the big picture. I think I am a good encourager. I really try to lift people up with my words and actions, although I don’t get it right all the time. But encouragement and motivation are an important part of physical therapy, so I think it is fitting that I am pursuing this profession. How do you use your gifts to serve others? I really try to love people where they’re at. I try to show people the grace I have been shown and remember that it is only because of God’s mercy that I am free. I feel called to work with kids with special needs, and I look forward to loving them exactly how God made them. I want to encourage them and show them that they are valued, they are important, they are perfect just the way God made them. What would you do if you had nothing holding you back from your dreams? I think I would travel a lot more – I wish we had the time and funds to travel and learn more about different cultures. I think that goes along with wanting to love people where they’re at and for how they’re created – I want to learn more people and show them God’s love that has been so graciously shown to me. Tell us about a season of suffering that lead to good things in your life. Growing up, I made sure I did everything I could to be “good.” I made the right grades, had the right friends, went to church and youth group, respected my parents, etc. So, in college, I was obsessed with maintaining this “perfect” image, so I would make the right grades, get into physical therapy school, and meet my husband, of course. The perfect life, right? I thought so. College came and went too quickly – I survived unscathed for the most part. Senior year came, and I had interviews with almost every PT school I applied to – I was absolutely thrilled. All of MY hard work and the seemingly perfect life I had finally paid off – I was accepted to multiple schools. I never dreamed that I would get to CHOOSE which PT school I could go to, but of course that’s what should happen, because I worked hard and made it MY goal, right? Graduation came, and I decided on the PT school to attend. I began in the fall after graduation, and I thought I was living the dream. I had the best boyfriend (who later became my husband! ), and I was fulfilling my calling of becoming a physical therapist. School was hard, but what graduate school isn’t? If it was easy, then everyone would do it, right? The first semester came and went – I survived. Whew. The second semester, now that’s another story. School has never been easy for me; I have always worked hard for my grades, but this semester was unreal. I struggled and to make a long story short – failed out. FAILED OUT. Me? The perfect girl? FAILED. For some reason, everything I was doing to try and succeed in school was. not. working. God was closing doors, and I had no idea why. Why couldn’t I do what I felt called to do since junior high?? Why did He lead me down this road, if all I was going to do was fail? I felt like I had failure stamped across my forehead. I still feel that gut-wrenching, stinging, heartache when I retell the story. I still feel the burn of holding back tears in my eyes when I relive it – even if only in my head. I failed. I felt like a failure. I was a failure as far as I was concerned. I couldn’t do what I thought God called me to do. I wasn’t good enough. I could go on and on about how terrible I felt about myself, but the truth is, I’m NOT good enough. I never was. I was always lying to myself by telling myself that I (or anyone else in my life – like boys) was enough. It took me a really long time to come back around to the idea of starting a physical therapy school again. Ask any of my friends or family about that time – they’ll tell you the same thing. I ran as fast and hard in the opposite direction of physical therapy, but eventually God broke through. He gradually put the people and conversations in my life to guide me back to PT as my profession. He is still putting all of the pieces of my heart together. Throughout all of the hurt, I found one of my favorite passages – Psalm 27:13-14 says, “I remain confident of this: I will see the goodness of the Lord in the land of the living. Wait for the Lord; be strong and take heart and wait for the Lord.” I love these verses because the use of the word “will” implies that David doesn’t feel or see God’s goodness right now. He is remaining confident – He is standing strong and convincing himself to trust God because GOD IS ALWAYS GOOD. Through the hurt, through the joy, through the mourning, through the dancing, HE IS GOOD. I still don’t fully understand why I had to fail out of school in order for His purpose to be fulfilled in me – but I know that He is using it for His glory. That’s my ultimate goal and purpose – use my story for His glory. I thank Him that through my hurt, I have been able to help others through similar situations and glorify Him even more. Share your proudest moment. Actually, I think my proudest moment may be deciding to return to PT school. It was NOT an easy decision – and school is still not easy, but I am confident this is where I am supposed to be. Regardless of the outcome, even if I fail out again, I know God has me here to glorify Him. I am more focused on knowing that HE knows the plan instead of trying to figure it out for myself. My outlook has changed from focusing on what I can do to knowing He is going to use me and put me exactly where he wants me. 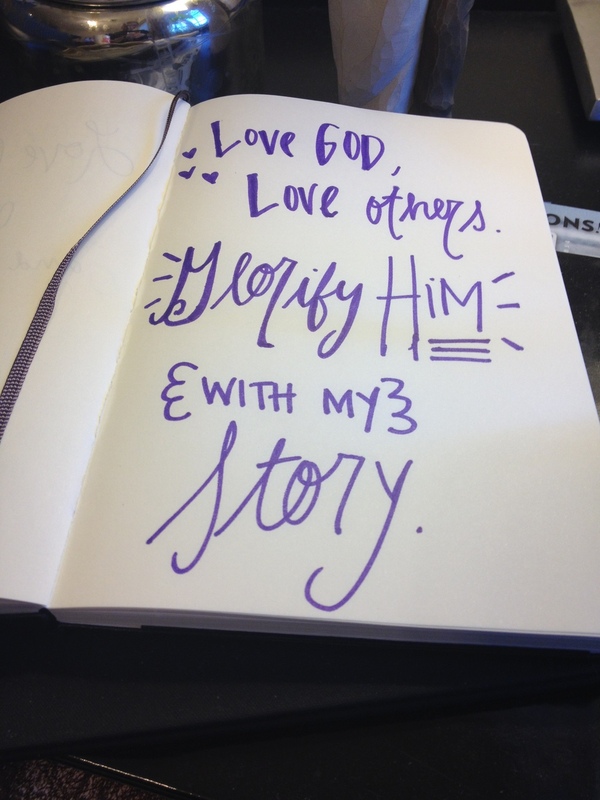 I feel my purpose in life is to... love God, love others, and glorify Him with my story. Jul 7 Let's be a light.